Just a day on the homestead running around doing stuff. It is basically spring here already this year and I had a lot going on, so I thought I'd try this experiment out. The pace is less frantic than some of my other videos, on purpose. It's still cut fairly tight with some good bits of information here and there, though that isn't really isn't why I made it. After receiving some comments referencing reality shows, I'm kind of thinking in that direction a little bit. I'm the type of person they contact for reality or re-enactment type shows and some of my friends have been on them or contacted about it like George Michaud, Cody Lundin and Tom Oar. My ex and I were approached about being on Wifeswap a couple of times, ha! I'm not likely to be interested as those are often very skewed and the subject may have little control over how it's all done once the footage is shot and it hits the editing room. When we shot a brain tanning segment for Modern Marvels (season 13 episode 9) their whole attitude was basically "is it good TV?" accuracy was not really much of a consideration. A lot can be done in editing and even an awesome and authentic person, like Cody Lundin on Dual Survival, can be diluted by the fake drama and manipulation of directors, producers and editors. My other homie Wylie Woods has been trying to get something together for a while with various producers and keeps getting jerked around and cancelled and told he can do it how he wants, but then maybe not so much. Screw that. I have potential access to millions of people who are hungry for something authentic and I can do it any way I want. Someone commented that I could have my own reality TV show. Well I do, and here it is! I'm sure I'll get better at it, but I think the production and even some of the content is secondary to authenticity in this type of thing. So, basically I'll interject some lifestyle/day in the life stuff sprinkled in with the down to the nitty gritty how to stuff and projects and all with occasional thought viruses, the transmission of which is why I'm here as much as anything... to influence the way people think about and perceive the world and what is possible. Posted on February 19, 2016 by Steven Edholm and filed under Homestead Lifestyle, tools, Homesteading, Paleotechnics and tagged day in the life homestead lifestyle turkeysong. It’s fire season again (the one where you get to have fires, not the other one) and I wanted to share something about the fire culture here at Turkeysong homestead. There has been a no paper rule in place in my households for a very long time. That is, there is no paper used to start the fire, just natural stuff. I am very pleased with this institution and hope to never change it. I’ll tell you why, and why I think it’s a good approach for people who are interested in self reliance, or in fire in general. I can’t remember when I completely stopped using paper, but I know that I stopped putting any paper into the fire at all when I began to process olives a lot. I wanted to use the ashes from the woodstove for curing olives and I didn’t want any paper ashes in there. Paper is an industrial product, so who knows what all is in there and what is and isn’t destroyed in burning, especially if there are any inks involved, which there usually are. Plus, burning paper smells nasty. That is one smell that I really hate, like when someone stuffs a bunch of paper in their woodstove or throws smouldering paper plates and napkins into a campfire. Ashes for processing olives must be very clean. The oils in the olive, like all oils I believe, are good at picking up smells/tastes. Well, it turns out that ashes from woodstoves in general are not very good for processing olives, because they tend to smoulder and create a lot of smokey and creosotey by-products. But the no-paper-in-the-woodstove-ever rule stuck anyway and I like it. Before that I very rarely, if ever, started fires with paper anyway, and that has more to do with my real point here. I may want to use my ashes for processing food, and eventually most of them end up in the garden, where they are an outstanding fertilizer, but the other major factor is that it’s just too easy to start a fire with paper. I have started a lot of fires in my life. I’ve spent a lot of time cooking over fires, both open fires and over stoves. If you cook over open fires, unless you manage them carefully to retain a coal bed, which not infrequently can require the use of extra wood, you might have to start several a day. I’ve also heated with wood most of my life. Then there is the lighting of campfires and burn piles and whatever else. There is a reason people start fires with crumpled newspaper- It’s easy. I remember my friend showing me his system for starting fires in the wood stove which started with a large pile of newspapers torn into strips. I was not impressed, though it was certainly fast and effective. Lighting fires with what is available (naturally) is an art. And like anything, it atrophies with disuse. Wait, back up there. It also has to be learned in the first place. I recall one of my first excursions into the woods that wasn’t like an organized backpacking type approach to camping. My friend and I went out into some park and picked a terrible low, cold, damp camping spot in some redwoods. I determined to get a fire started so we could cook and stay warm and all of that. I had brought a magnesium fire starter with a zirconium striker. I got plenty of white hot focal points of heat from that thing, but no fire. Everything was damp to wet. I had no idea how to find anything drier, how small to make stuff, what to collect species wise, that I should get wood that wasn’t on the ground, or take the wet bark off, let alone how to organize the stuff to get it to burn and spread the fire. Fortunately, I also had a book of paper matches and a candle. I used the entire candle, and all the matches to barely get a fire going by dripping the candle constantly over all this wet steaming redwood with the soggy bark still on it. Can you say green? I was so green. OMG! I knew I was lame though and had something to learn, that was obvious enough. About 20 minutes later with the fire actually gaining a little momentum, the whole redwood grove lit up in a brilliant white light. I had left my magnesium fire starter on the edge of the fire! Ooops. It was a good light show anyway and now the fire was really going! For you survivalist types that think your magnesium fire starter is an indestructable, weatherproof option, there is a mistake that is easy enough to make! It shouldn’t take a book of matches, a candle and a magnesium fire starter to start a fire! Or paper for that matter. Amazing thin, crumpled, fast burning paper. Even if it’s a little damp, it dries out as it burns. The stuff is amazing, like someone made newspapers for starting fires. When you stop using paper to light fires though, you find out that there is much more to building a fire with wood that is bulkier with a much lower surface area. Take a given volume of wood, say a cube the size of a gaming die (as in singular of dice). Put a match to that and it’s probably not even going to catch flame. reconfigure that wood into a 1/4 inch diameter long stick and it has much more surface area and a less bulky cross section. It may likely catch fire, now but it might no continue to burn well on it’s own. Grind that up and make it into a thin sheet of paper and the low bulk of the material plus all that surface are makes for very easy combustion, especially when crumpled up! There are things in nature similar to paper in their combustion properties, shredding barks and straw for instance, but they are not always common or available, or what happens to be dry at a given time. This scenario has been repeated many times here: Plop an intern/visitor down in front of the woodstove and say light a fire. “Where’s the paper”. “We don’t use paper… blah blah rationale for not using paper, blah blah, etc…” Give them 10 or 15 minutes and the result is a frustrated person. So, you give some pointers, basically lay out a system that can be roughly followed and let them go at it, maybe give some pointers here and there. It always takes a while, but it’s always a revelation. With a stove full of crumpled newspaper you just don’t have to know that much about fire and how it works and spreads. Not nothing for sure, you can still easily fail to get a fire kindled, but there is much less need for understanding how fire works. Starting from scratch is a whole other deal. Suddenly you have to think a lot more about size, shape, condition and architecture- how fire spreads and all these things that matter incredibly much when you don’t have something ridiculously combustible on hand to give a quick heat base. Suddenly, you are intensely involved with nurturing a new life along. It is compelling, intense and maybe in a word, engaging. Just yesterday someone staying here was trying to start a fire in the cottage. The wood was all damp (not by any fault of mine BTW). And she was like, “can you start the fire? I’m hurrying (and mumble, mumble something or other).” I was like, sure, then I realized the truth probably was that this was just not a common scenario for her. Tamara had pulled the no paper in the woodstove thing on her and it was not working out that great. The wood was damp, it had to be split small or shaved and fed in a certain way at a certain rate. Not a big deal for me. I didn’t have to re-tool my methods much, or more importantly, my expectations of what it takes to light a fire. That is just my life, not a new inconvenience to navigate and overcome. By the time Kendra left, she said the most valuable thing she learned was simply how to start a fire without paper. Not without matches by rubbing sticks together or anything super primitive and exciting like that, just how to take some wood and put a match to it and have it all work out eventually. I was suprised at first, but that really stuck with me. Watching so many people struggle with perfectly sound dry wood in an indoor environment and remembering some of my early experiences, I’m so glad to have the no paper rule in place. It’s not just for other people either. It’s for people that live here too… for me. It keeps expectations low about what it means to start a fire. It keeps us engaged with the fire, with the local materials, and with the process and phenomenon of fire. One last thing. This is a pretty strict rule. Unless I’m in some huge hurry, I don’t start my fires indoors or out with paper. It is occasionally tempting, but I just don’t do it. I don’t dowse my burn piles in diesel either. 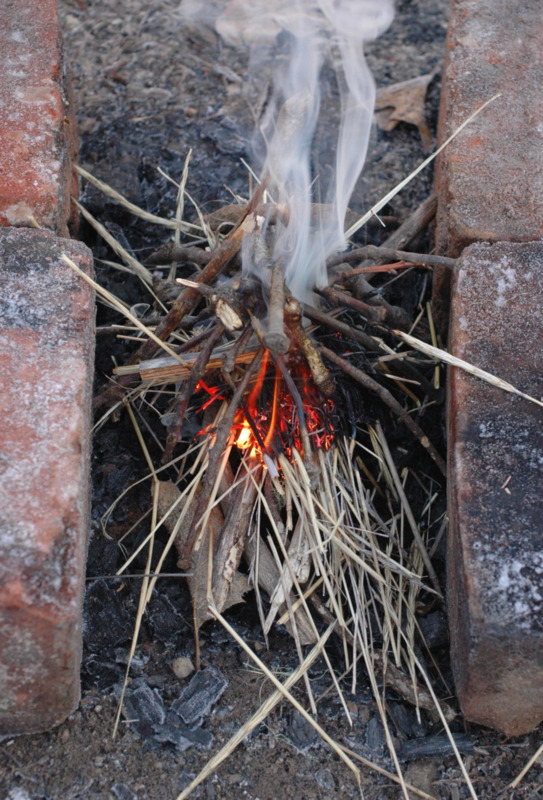 If I’m doing a lime burn, I set up the fire lay carefully before stacking the kiln and run around and spend the 15 minutes or whatever it takes to make a bundle of fine twigs and pitch wood to shove under it through the air hole to set it off. Because if the rule isn’t strict it’s just too easy to fall off the wagon and never do it from scratch. I’ve spent a lot of time with severe fatigue and malaise over the last 15 years or so. I mean to the point where even basic tasks seem like big hurdles, and it’s hard to just take care of my basic needs through some days. But, the no paper rule always holds, no matter what. That makes it just something that I do, there is no easy option available. If I want easy fires, I have to prepare or collect kindling ahead of time. If I want it really easy, then I make some split pitch-wood sticks to have on hand (more on which later). Two of those and it really is pretty damn easy to light up the woodstove or barbecue. But it is my responsibility to make that happen. It doesn’t just show up in the mail once a week as the local advert. I highly recommend the no paper rule if you heat with wood, or just in general. It will make you and those who enter your sphere more broadly adapted for all the reasons I’ve already elaborated above. The wood you burn and the resources around you will mean a little more to you. You’ll understand them better, and I daresay appreciate them more in some way. It is yet another level of engagement with your environment, contributing to your general physical competence, independence and understanding. It will also increase your survivability by extension, and I think that is generally the best way to increase it. Posted on November 21, 2015 by Steven Edholm and filed under fire, firewood, Homesteading, Paleotechnics and tagged fire fire building building fires how to build a fire paper for lighting fires.